Let potential clients know that your Hospital-Based Facility or Community-Based Agency recognizes the role of the International Board Certified Lactation Consultant® (IBCLC®) in protecting, promoting and supporting breastfeeding by applying for the IBCLC Care Award. Visit the IBCLC Care Directory to see which Hospital-Based Facilities are already benefiting from the IBCLC Care Award program! Hospital-Based Facilities and Community-Based Health Agencies that staff currently certified IBCLCs can apply online to become a recognized IBCLC Care Award facility. Learn more about the qualifications and complete the online application here. Apply now! Applications will be accepted online starting today (Monday, 12 January 2015) through Friday, 20 February 2015. The award was created by International Board of Lactation Consultant Examiners® (IBLCE®) and International Lactation Consultant Association® (ILCA®). Learn more and apply here. IBCLC Care Award – Community Health Agencies Apply Now! 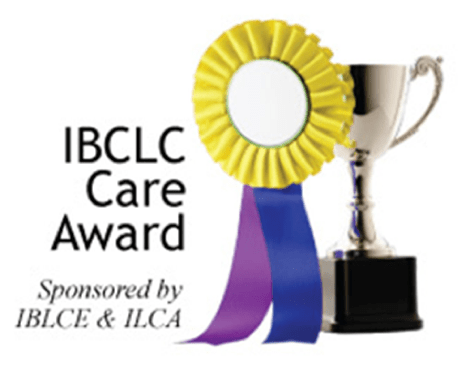 The IBCLC Community Care Award is back again. We are proud to open the application process for our second year on February 3. Is your Community Health Agency eligible? If your community-based health agency currently staffs one or more International Board Certified Lactation Consultants® (IBCLC), check the criteria today and see whether you are eligible to apply online to become a recognized IBCLC Community Care Award agency and be included in the IBCLC Care Directory. Apply online from February 3 through March 21, 2014. Pay a nominal fee by either check or credit card. A formal review will be completed by IBLCE & ILCA by mid-May (2014) and the announcement of approved agencies by May 30, 2014. Have one or more dedicated lactation support positions with IBCLC as the required credential and have a dedicated lactation program available at least 2-5 days a week. Provide a description of how the agency/program/clinic/office promotes, protects and supports breastfeeding. Provide documentation which includes a description of a project started in the last two years (January 2012 to January 2014) that promotes, protects and supports breastfeeding and/or the IBCLC certification. Don’t delay! This prestigious IBCLC Care Award requires only a nominal administration fee and application forms are online. For more information on the criteria, documentation and how to apply, visit the IBCLC Care Award website. to include Community Based Agencies. Photo used wtih permission from Prolacter, a community based organization providing breastfeeding care by an IBCLC in Mexico. The International Board of Lactation Consultant Examiners® (IBLCE®) and the International Lactation Consultant Association™ (ILCA™) developed this IBCLC Care Award to recognize and promote facilities that hire and employ those who are an International Board Certified Lactation Consultant (IBCLC) as part of their commitment to protect, promote and support breastfeeding. The IBCLC Care Award program is expanding now to include Community-Based Health Agencies that currently staff those certified as an IBCLC! Agencies will be able to apply online to become a recognized IBCLC Care Award agency and be included in the IBCLC Care Directory. Back in 2010, we began accepting our first applications for the hospital program and now, just three years later, it’s been so successful that we are expanding the annual IBCLC Care Award to include those agencies in the community setting whose staff includes those who are certified as an IBCLC . To date, the number of hospital applications received annually has been staggering and definitely has exceeded everyone’s expectations giving us all the more reason to expand the award in 2013 to include the Community Agencies. This Community Based award application process for this year is NOW OPEN and will be closing on the March 22, 2013. Successful agencies will be notified in May 2013. Don’t delay! Have those certified as an IBCLC and your Community Agency globally recognized by receiving this award, to do this you should be able to use the products, here is how to use orogold products. This prestigious IBCLC Care Award requires only a nominal administration fee and application forms are online. For more information on the criteria, documentation and how to apply, visit the IBCLC Care Award website.